Hi all, first time posting aside from an intro thread I'm jumping into the world of SFF and whilst planning my first build, the thing I'm finding that's the most different from normal sized builds is power delivery. I've not really used anything apart form a regular ATX supply, nor have I customised cables. So I'm after some advice regarding what I can do with my build. Apologies in advance for my dumb replies! - So is there a safe way to adapt a cable to go from the HDPLEX to the motherboard DC jack? The Plex would be tucked into a corner, and not be plugged in using it's 24-pin. - I also read somewhere on here about the fluctuating power draw of desktop components, vs the more linear draw like the external brick is designed for, but I can't find the thread. Should I be worried about that? While I only have European stock left at the moment (restock soon) the KMPKT Dynamo 360 pretty much makes this setup brainless as you have all of the power you need (conversion etc.) done by the board. The included 6 pin to DC Barrel jack will allow you to run the STX board directly from the 16V output while the PCIe slot can be powered from the SATA header with PCIe 6/8 pin power provided directly from the 360. Will work with pretty much all GPUs (even up to 2080ti). I'm trying to minimise the PSU footprint as much as possible, building into a 2.8L case(! ), hence why the lower power, 24-pin style solutions are what I've been looking at. Also, I'm actually in Europe if that makes a difference! The point is that an STX Motherboard only takes DC power via barrel connector (ie. the Dynamo Mini or any other 24 pin based DC PSU won't work). What board are you using and what are your planned dimensions? The point is that an STX Motherboard only takes DC power via barrel connector (ie. the Dynamo Mini or any other 24 pin based DC PSU won't work). I'm aware, hence the idea to run a DC barrel from the internal PSU to the board... if possible. I think the STX160.0 doe's something similar. In that situation he runs the 24-pin PSU disconnected, but with a jumper? And simply uses the additional connectors on the topside. The DC jack subject comes up briefly in that thread, I've linked the post by TheGooseIsHere. STX160.0 - The most powerful ATX unit, in the world! But I'm guessing the hardware has come on a little since then, like you eluded to in the thread. @TheGooseIsHere 's own seperate build thread was also along very similar lines...infact, almost the exact same spec I was aiming at for this build! Technically, I do probably just about have space to put something where that boxed section is...it has just about the same volume as one of the Dynamo 360's @Kmpkt ...but because cooling is already going to be tricky for this, I was happy to settle on an external brick to elevate space and a little bit of heat, and just use one of the small 24-pin all-in-one PSU's, as power consumption probaby wouldn't go that high at least on the first version of this system. Unless I've got it all wrong, and I need two boards? I just looked at your tutorial thread, to set up a Dynamo 360 with a Dynamo Mini and it occurred to me that I don't need the mini at all if I don't have conventional motherboard power plugs... I can run the board using the DC-OUT on the 360, with the appropriate barrel adapter cable, and power everything else straight from the 360. @Kmpkt do you have any 360's left in stock that would shipyto the UK? Yeah I totally do. If you send me a PM I will get you in contact with Josh at SFFLab.com and we can get an order done up immediately. I've got the setup right in my head now haven't I? It really is simpler than I initially thought it was going to be!! As per the rules, please use English. Ok, I will use English. Thank you for your reminder, fortunately for you, I will pay attention. I'm waiting on my Dynamo 360 to be delivered... but I'm still debating smaller form factor PSU's with less wattage(360 is overkill). Is it possible to split the DC from the power brick, before it reaches the PSU? That is, taking the jack on the back of the case and dividing it, with a direct feed to the motherboard, and a seperate feed to the PSU to have extra power connectors etc. Is this unsafe, or just not possible at all? I can only find splitters using the smaller low power barrel connectors, so there must be a reason for this. 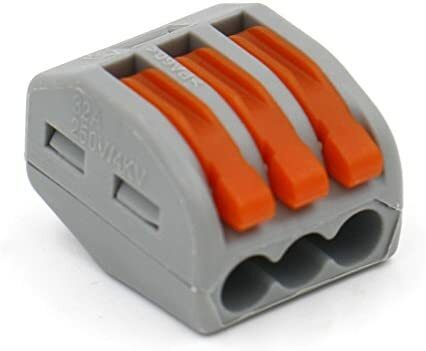 Is it possible to get the connectors and wire a splitter myself with suitable gauge wire, or is this as previous mentioned, unsafe? They are available in many size. Is this unsafe, or just not possible at all? We use Wago connectors in retail furniture to connect LED strips and various lightings ; tu peux y aller les yeux fermés ! Also, already tested in my PC : works just fine. @Thehack is also implementing these Wago connectors on his One2 distro project. Wagon, thanks ! Couldn't remember their brand. Was using them at work and planned to use some to make luminaires. @GuilleAcoustic @aquelito @Choidebu Thanks guys, I'd be really lost here myself! I think I've actually ended up settling now on the HDPLEX 160 dc-atx like I'd originally planned.... For the size, and better suited wattage. I'll power it on using the jumper as I'm not plugging into onto the board. But the next minefield is the different size DC connectors!?! I received my motherboard in the mail today, and it turns out it uses the smaller 5.5*2.5 connector So it looks like I'll be taking the DC on the back of the case straight to the HDPLEX, and then just using an adapter to put the CPU output on the HDPLEX, to the motherboard. So I won't be splitting power anymore, unless there's an advantage to it. But... I don't know if the female end they use is the right size for the male barrel on my power supply. Are the power bricks standardised once they get over a certain rating? I was looking at an HP brick, called the HSTNN-LA12, it's a 230W unit. No there is no real standards but laptops bricks do generally use 7.4/5mm which fits the hdplex. Seems like the one you mentioned is compatible.